"One man's mythology is another man's religion." What I'm going to suggest first here is probably a horrible thing to do to a perfectly lovely poem, on the one hand; but, on the other, it is, perhaps, a way of explicating it and, at the same time, illustrating how we use punctuation to make meaning. 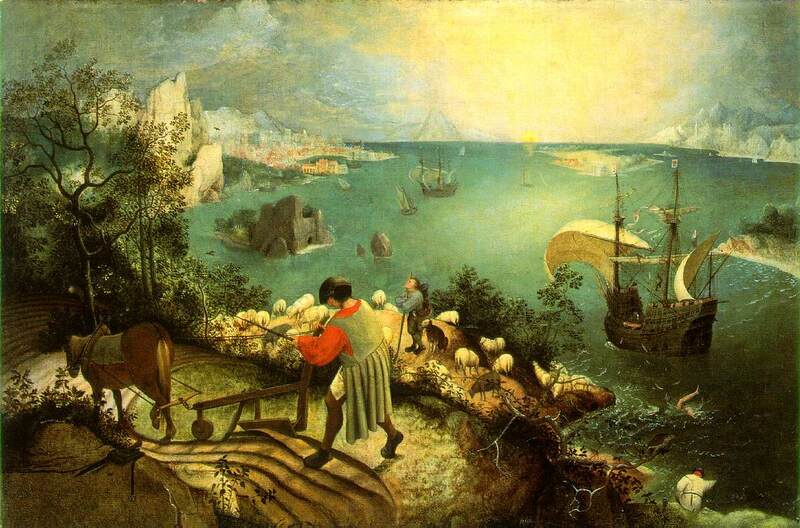 William Carlos Williams, a 20th Century American poet (and physician) wrote a moving and descriptive poem that captures the essentially existential message embodied in the painting "Landscape with the Fall of Icarus," a work completed circa 1558 by the Dutch painter Pieter Bruegel the Elder (1525?-1569). First, it would help to know something about the Icarus myth, so read a short version of the story about Daedalus and his son Icarus by following link to the Greek Myths & Greek Mythology, and read a somewhat more in-depth version of the story of Daedalus and Icarus at Myth Man's Greek Mythology Today web site. Like most versions of Greek myths we read today, these vary slightly. Give some thought to why that is the case because we will discuss that topic briefly in class. Critical interpretation question 1: In its historical context, what was the message or moral of the Icarus story? It might help to know what the word "hubris" means in its original historical context, not just as it is used today, because most scholars agree that hubris was the boy's downfall. Historically, "hubris" does not mean simply arrogance, nor does it connote disobedience to a parent. Critical interpretation question 2: What does this painting by Brueghel say about the nature of myths in the everyday world? Answer in a few sentences. Task 3, reformatting and editing: Finally, highlight the text of the poem to copy it (right click your mouse button); then paste the poem into an M.S. Word document. Without rewording it in any way, refomat the poem into grammatically complete prose sentences and punctuate them correctly so that it describes the painting and conveys its meaning as would a description of the painting in an art history book. Double space the whole document.